WAFER THIN, LIGHT & MAILABLE! 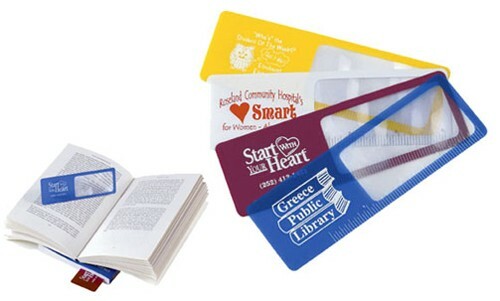 Flexible, Unbreakable Bookmark Magnifier with Fresnel Lens and 4 inch and Centimeter rulers in 4 colors. 5X magnification and clips onto pages as a bookmark. Cello bags can be shipped bulk at no charge upon request. See “Options for inserting into cello bag and 2nd side imprint. The perfect low cost mailing promotion. Price includes a one color hot-stamped imprint on front. IMPRINT: 5 lines of straight type foil hot-stamped in one color in a 1 3/4"w X 1"h area on the front is included without a set-up or die charge, other imprint locations may be available upon request. Additional lines of straight type imprint are $5.00(A) per line, per order. See "Options" for 2nd side imprint.